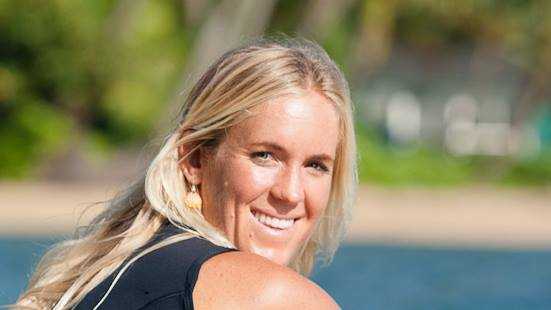 WHEN Bethany Hamilton was 13 years-of-age she lost her right arm in a shark attack. But that has never held the Hawaiian surfer back and today she showed exactly what she was capable of when she knocked Tyler Wright out of the Fiji Women's Pro which is being held at Cloubreak off the island of Tavarua. In perfect, reeling three to four foot left-handers the 26 year-old put on a clinic even knocking out Australian Tyler Wright who has won three of four events this season. While barrels were scarce as conditions were for the most part too small to get inside the tube, Hamilton put on a clinic positioning herself perfectly inside the wave on several occasions throughout the day. Despite losing her heat Wright had nothing but praise for her opponent. "She's the greatest human probably ever," she told WSL afterwards. And clearly the good feelings are mutual. "I'm pulling for her to win the world title this year," Hamilton said of Wright. "She's one of my favorite humans in the world." Hamilton has now progressed to the quarter finals where she will take on Australian surfer Nikki van Dijk. Van Dijk is presently ranked number 13 in the world and hails from Phillip Island in Victoria.